As Dartmouth College approaches its 250th anniversary next year in the midst of an unprecedented $3-billion fundraising campaign, three Black alumnae are making history as the first African-American women to hold their top leadership positions. 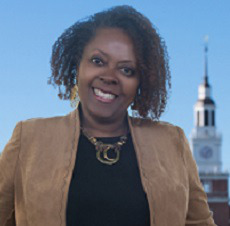 Dr. Adrienne “Tee” Lotson is president of the Dartmouth College Alumni Council, Cheryl Bascomb is vice president for alumni relations and Laurel J. Richie is chair of the university board of trustees. They are instrumental in rallying support for the school in general and for “The Call to Lead” drive in particular. After skipping the first and eighth grades, the 16-year-old Queens high school graduate had plans to attend UCLA or USC, study performing arts and wow the world as an actress. Instead, like her big brother, she ended up at Dartmouth. And she remembers the shock she felt when a White instructor told her class on the first day that Black students do not get an A in his class. It wasn’t the only such challenge Lotson would face at the renowned Ivy League institution, but as she matriculated she found much that she loved, including good friends, sincere advocates, an ethnically diverse range of nurturing faculty and administrators, talent for acting and opportunities to lead. Dartmouth has had a reputation for attracting more politically conservative students, counting among its alumni Laura Ingraham and Dinesh D’Souza. Lotson was on campus during the 1980 debut of the controversial, right-leaning student publication The Dartmouth Review. However, the college is “much more diverse than the media portrays us,” Lotson said, citing as an example celebrated Black TV producer and screenwriter Shonda Rhimes. After graduating in 1982 with a bachelor’s degree in psychology, Lotson went on to earn a juris doctor degree from the UC Berkeley School of Law in 1987, a master of divinity degree from the Interdenominational Theological Center in 2001 and a Ph.D. in anthropology from the City University of New York in 2017. Now an administrative law judge and hearing officer in New York City, Lotson’s professional career path has included a number of pioneering roles. She was the first Black woman to serve as an enforcement representative for the NCAA and the highest-ranking Black woman in the sports department for the 1996 summer Olympics in Atlanta. Where Dartmouth has not taken Lotson, it has followed her. Her love of world travel was sparked when she went to Spain on a study abroad program as an undergrad. During her one-year term as alumni council president that began in July, she wanted to inspire Dartmouth’s 81,100 alums to remember and support their alma mater. 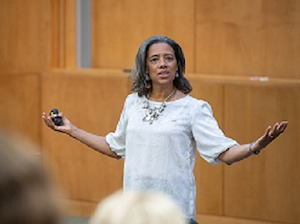 While the relationship between alum and alma mater often becomes more distant over time, Bascomb’s relationship with Dartmouth grew broader and deeper after she – like Lotson – graduated in 1982 with a bachelor’s degree in psychology. The former collegiate rugby and track star spent her first two years working in the college’s admissions department. She later married another Dartmouth alum, and their daughter received her bachelor’s degree from the college in 2012. Over the decades, Bascomb has volunteered in alumni efforts at regional and national levels, including serving a season as vice president of the alumni association. So when it was time to hire a new vice president for alumni relations, Bascomb was an obvious choice. Dartmouth lured her from her position as director of marketing and business development for BerryDunn, where she had worked since 2001 following leadership and marketing roles with companies such as L.L. Bean, Unum Life insurance and Gofish.com. The Washington, D.C. native started June 1 and looks forward to providing strategic vision and direction for alumni engagement, programming, communications and volunteer leadership service. She says she’s passionate about marketing and working with her staff to find innovative ways to communicate with and engage alumni to participate in advancing Dartmouth. The college’s commitment to faculty and student diversity is evident, she said, and a source of pride for alumni. The contrast between the urban community in which she grew up in the District of Columbia and the rural serenity of Dartmouth’s Hanover, New Hampshire campus beckoned to her during her college search. Significant representation of female students and a strong focus on the undergraduate student experience also drew her in 1978, and those are some of the things that drew her back as an administrator. It was love at first sight for Richie, who is in the second year of her three-year term as chair of Dartmouth’s Board of Trustees. When she initially visited the campus on a gorgeous spring day, she recalled crossing the Connecticut River, traveling up a hill and then seeing the college’s picturesque ‘Green’ and the distinguished buildings of Dartmouth Row unfold before her. And everywhere, students walking, conversing, interacting. She also developed a love of theater, where she honed skills such as teamwork, communication, stage presence and being comfortable in front of large groups of people. Richie graduated in 1981 and decided to pursue a career in advertising after being impressed with an ad executive who interviewed her. He impressed her, and she liked the idea of using creative and problem-solving skills and engaging popular culture to reach various audiences, particularly female consumers. 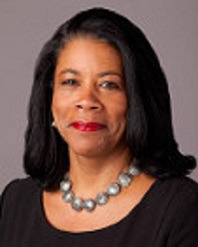 During her professional career, she was one of the first women and first African-Americans to work at Ogilvy and Mather ad agency in New York City, rising to senior partner before leaving and founding the agency’s Diversity Advisory Board. Then it was on to Girl Scouts of the USA, where the former Girl Scout led rebranding as senior vice president and chief marketing officer. Then Richie went to work as president of the Women’s National Basketball Association (WNBA) from 2011-2015, during which time the WNBA extended its broadcast agreement with ESPN and sealed a ground-breaking eight-year agreement with the players and their union. Richie, who also counts a brother and niece among Dartmouth alumni, frequently reflects on the pioneering courage of her parents, who dared to find a way to move the family when Richie was young to a home where the owner had refused to sell to Black people. Now deceased, they instilled in her pride in work and commitment to building diverse and thriving communities – an ethos she brings to her service as chief among Dartmouth’s trustees.